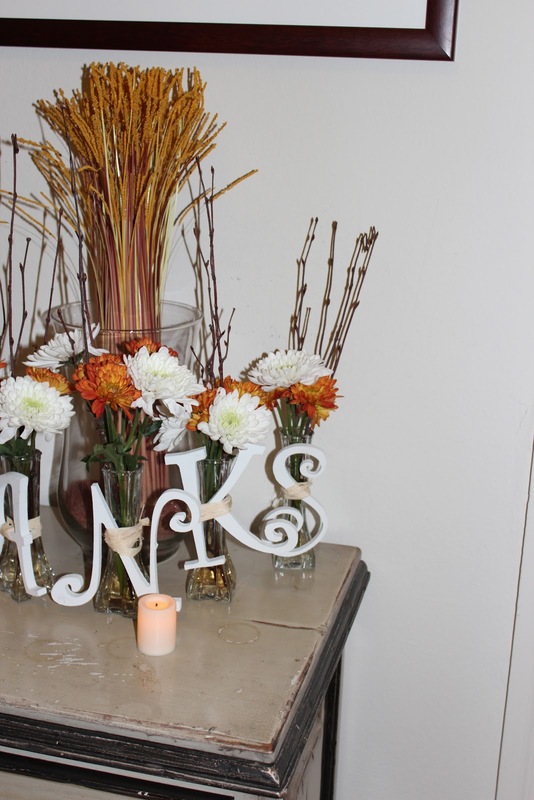 Need some ideas to spice up your home for Thanksgiving? It's not too late. Here are some quick crafts that can make your home look festive for the feast. What you need: Mini vases, letters from Michaels, Raffia, flowers, or dried branches.Tie the letters to the vases with the raffia and fill vases with fall flowers or branches. Place in a line on a table or mantel. Mason jar and vase are both from Michaels, wrap vase with rope, and place between pumpkins from Trader Joes. Arrange on a plate with either paper leaves or fresh leaves. Leaf cut cheese plate. Use leaf cookie cutters to make a fall cheese plate. To make it quick buy pre-cut cheese and use cookie cutters.